The Forged 735.CM™ irons feature a blended design for the skilled player seeking the ideal combination of shot control, maneuverability and playability. Designed as a seamlessly blended set, Titleist Forged 735.CM irons have continuity in performance and aesthetics for a fluid transition from long to short irons. Excellent forged feel, typical blade like shot workablility and pin sharp distance control right through the set. A compact head and thin top line seems to dictate an unforgiving players club, but one is surprised to find the 735cm are anything but. Also quite liked the fact the 735cm feel to have a little more weight compared to most. As with most blade like designs the 735cm are probably not for beginners. The 735cm being forged stainless will wear and tear much quicker than cast clubs. To all of you readers out there these babies were and still are the most played irons on all tours.Titleist really did capture lighting in a bottle when they introduced these irons.Being a former tour caddie i've seen em all,by far the 735s are with out a doubt atrue players dream club. I know guys that would love to game these on Sundays rather then what they are being payed to play.This set is the one that the pros play when they are having some serious money games,a true testament of what a true set of irons are worth. Great feel-great performance. I have s300 shafts and find this combination is easy to work and accurate. Note, these are not distance irons and have traditional lofts. They are not for higher h-cappers. I will caution, they will balloon into the wind with s300 shafts, but easy to knock down. Super spin into greens. Tourney vip vfoil blades--great irons but no forgiveness what-so-ever.Titlest ap2, longer but clunkier. I have played golf for over 30 years. Started out with the old blades, went to Wilson FG-17's and progressed to Ping and cavity back's through the years. My recent model was the Callaway 2006 Big Bertha's which I have had for about 5 years. Easy to hit, I won several tournaments with them and made a lot of money on various courses but I had trouble from 160 in in accuracy. I was playing in an Invitational recently and my buddy had a set of Mizuno forged MP 57's and another had a set of the old MP 33's. Nice looking and clean, he hit some really good shots with the 57's. After the round he let me hit them and it was like a light went off. Wow! That was what I had been missing. I hit the internet for reviews and, looking for a deal and the best performance, settled on the MP 32, the "Cut Muscle" club that still draws raves. So, I did what I do best - used patience, talked to many friends, researched ebay and the net and found a killer set of MP 32's at a great deal. To say these clubs are easy to hit is an understatement. Despite being blades and very small (compared to my Big Bertha's) even the 3-iron is relatively easy to hit. Now, I am not a pro and hit the Callaways (great sticks) well, but the forged blades are the answer to a game that needed something extra. The long irons come out low and strong; the mid irons are higher and very accurate with a slight draw bias and the low irons are to die for. I had trouble controlling cast irons around the greens (9-8-7) but these are like throwing dice at a wall. Set up behind the ball is clean, they are easy to hit and very, very accurate. When I move to another set of clubs, I will be sticking with forged irons. The fell, as we have all read, if pure "butter." I contacted Mizuno customer service in my search for irons and could not be more pleased. Jeff Crawford helped me with every single question I had, even attaching spec flyers with emails when I had a question about speficic clubs. Used Wilson FG 17's, Ping Eye 2 (copper), Ping I-3 (os), Ping Zing (copper) and Callaway Big Bertha (2006). I play off 6 and moved to these irons from the Taylormade r7 tp irons. I bought these irons off ebay (£125) in chrome finish 3-pw in stiff steel. Firstly these irons are gorgeous looking, made my TM irons look massive!!! I didnt bother with any range time, just went straight out onto the course, and I must say the reults ever since have been great. First 9 holes I shot 20 pts, then won the comp on the following sunday. I will say its early days but every round since has been positive, with my handicap going the right way!!!!! I just love striking these clubs, the ball reacts like a bomb off the face, and I am now able to shape the shot as I want. I was only able to hit a high draw but now hit low cuts,low draws etc etc. There is forgiveness in these irons, but if you are NOT a consistant ball striker then dont bother with these, you wont see the benefits. The irons sit behind the ball lovely, the slightly smaller head compared to my TM's for some reason just looks far far better, and they just make me committ to every shot. I have not gained any distance with the clubs compared to my r7 tp's but that wasn't what I wanted. 3 - 7 irons are lovely but its the 8 - pw blades that make this set. The ball just booms off the face, and the grip I now have on the ball is crazy. Having been a cavity back player since starting, I was rather nervous about the blades BUT now I wish the 7 and possibly the 6 were blades too. The long irons too are great, Titleist truly did make a great set of clubs when they made these, and I would suggest them to any player in single figures. The response, look and feel of these clubs is wonderful, and I see nothing but positives!!!! If I were to be picky then my only thing would be wishing that the 7 iron was a blade. I rate these irons 9.5/10!!!!!! I have played a set of Titleist DTR's for about 15 years. They were my first real set of golf clubs and they were great while I was learning the game. Up until a few years ago I would play 4-5 rounds a year and never felt upgrading would be cost beneficial. The past few years I have upped my rounds to about 10-15 per year and finally decided to pull the trigger. I looked at a few sets but really felt I wanted forged blades instead of the game improvement irons. I scoured Ebay and reviews and decided on the 690 or 710 blades. I could not find a set that was low enough for me so I decided to go to Golf Galaxy and see what sets they had for sale. They had a set of 735 CM's that i took to the launch monitor and after 1 hit I knew I had to have them. With my DTR's I hit my 6 iron around 160 but the 735 went about 180 (did on the course as well). 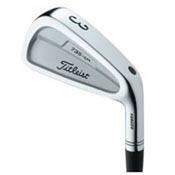 I like this set because it has the cavity back for the longer irons but the control of the blade on the short irons. I took them to the driving range the same day I bought them and couldnt hit anything square (tops, slices, and hooks). I re-gripped them with winn 6pchy-bbl blue oversized grips and when I hit the course it was money. I think proper grips make a huge difference in club performance. I consider myself a very good iron player and have hit more greens with these irons on par 3's than I ever did with my DTR's. If you hit the sweet spot on a regular basis these irons might be for you although if you struggle to make solid contact you might want to get a set of game improvement irons. If you are playing a set of antiques like I was, you might want to consider getting these irons. Purchased these off of ebay the other day in chrome and immediately took them to the range. I have played with a set of older 762's for the last 5 years and hit them pretty well or so I thought. All I can say is "Hot Knife thru Butter". I usually avoid playing in winter because the hardpan in Oklahoma doesn't agree with the bounce on my irons. No more because from the first ball I hit off of hardpan dirt, I knew these were the real deal. Last year, I tried the AP2's last year and could never make them work. (Too clunky). The 735's have a very slim topline which inspires major confidence letting you know you can work the ball at will. Choking down allows you to flight the ball in the Oklahoma wind with ease. The soft, buttery chrome has an addictive feel that no stainless club can match. After the range, I couldn't wait to take them to the course. The misses weren't as bad as my 762's and the ones I hit on the screws were ridiculiously good. A couple times I drove the ball into jail and both times was able to manipulate it through and around the trouble and onto the green. I can't wait to get back onto the course and really groove these. If they are this easy to hit off of tight hardpan, I look forward to seeing what they can do off of grass. Titleist irons continue to impress once again. If your handicap is 10 or less, GET THESE IRONS! They are SICK! I have tried Mizuno blades and Cleve cg15's. Nothing compares to these. Wow! I am 14 playing of 13 and I was given these clubs about 9 months ago by a trainnee pro, and I must say they take som getting used to, but my handicap was 23 when I started using them. I think they come out with a low ball flight and long distance. Been playing with this set of 735 CMs for 3 seasons. With hcp of 4, I still had some difficulties getting started with these after striking with old good Nike Pro Combos. Titleist irons seemed to feel heavy, compared to others I've used and many other big brand irons. After getting used to heavy feel and lazer sharp feedback, I have to say I love my 735's. They look good, they feel just as good as you deserve (bad shots make you wanna cry) and the ball flight is very much how you hit it - although you do not get any ballooning by accident! I would not recommand these for anybody. You have to strike ball solid to get everything out of these beauties. But for those who can... OH BABY!